If a linked account has been created for you, you may want to link your existing users so that they have access to the linked accounts. 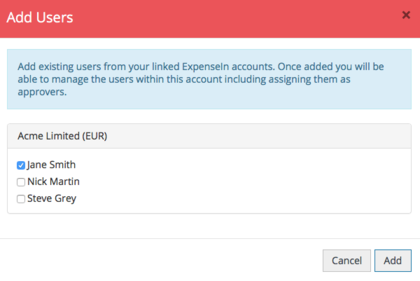 If you would like to understand the linked accounts feature in more detail, please contact our support team (support@expenseIn.com). Please note: This feature has been primarily designed for linking finance teams and/or approvers. 1. From the Admin area, by default, you are already in the Users section. 2. Click the Link Users button. 3. Add existing users from other linked account(s) to this account. Select the users by ticking the box next to their name and click Add. 4. The user(s) from the linked account will now appear in your Users list. The linked users will be sent an email explaining that they have been added to the account and are told that they can now switch between the linked accounts. 5. You can now manage those users on this account. For example, you may want to manage their permissions and assign them as approvers.